These are by far the most robust and functional calculators TI has ever sold. Durable like a TANK with longevity in classrooms for over a decade with all the up to date functionality for all standardized tests and beyond! This is our top selling item, because of how durable and useful the TI-84 Plus School Property Edition is. Most of our Refurbished items are in pristine condition and our schools have been very pleased with the cost savings for such fantastic quality! Place your order today and we'll ship it within 24-hours, because we carry all our inventory in stock in house! Buy Worry Free with our 6-month NO HASSLE exchange policy. If anything goes wrong with the item, we'll simply replace it with a prepaid label for FREE. Think Costco...no hassle, no worries. Extended 6-months warranty. 30-Day Money Back Guarantee. 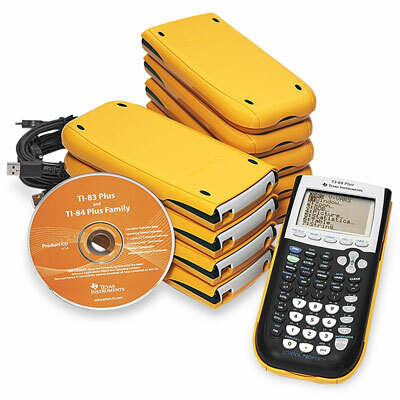 TI-84 Plus EZ-Spot Classroom Pack - includes 30 TI 84+ graphing calculators, each with a bright, easy-to-spot, "school bus yellow" back cover and slide case. In addition, each unit's faceplate is inscribed with the words, "SCHOOL PROPERTY." TI 84 Plus graphing EZ spot calculators have the eye-catching color that makes them easy to identify as school-owned property. Each unit has the words "School Property" on the bottom to deter theft. 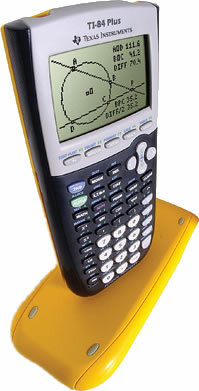 TI 84 Plus graphing calculators can connect to TI ViewScreen™ and/or TI-Presenter™ projection devices with a an TI-84 adapter (available separately). Great Decision - Coming back next year. Our School Was Thrilled to Find Math4Sale and save over $3,000 on our order of TI-84 Plus Teacher Packs by buying refurbished. Thank you Math4Sale.